MIAMI: US agents Friday seized from a Florida museum an Italian Renaissance painting which officials said was stolen from a Jewish family in France during World War II. 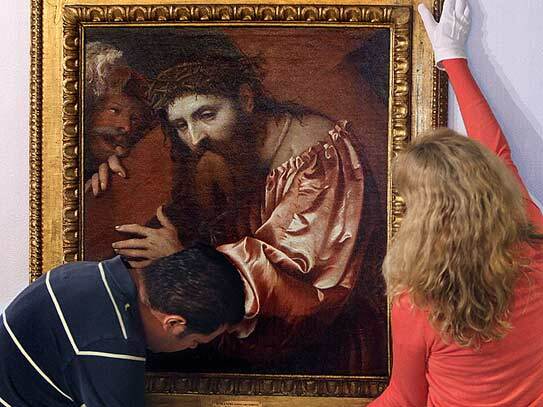 The Girolamo Romanino work “Christ Carrying the Cross Dragged by a Rascal”was seized from the Mary Brogan Museum Of Art and Science in Tallahassee, according to Immigrations and Customs Enforcement (ICE). “The painting was seized through formal legal proceedings, to protect the art until its real ownership is finally confirmed,” an ICE statement said. The painting, which dates to around 1538 from an artist also known as Il Romanino, depicts Christ, crowned with thorns and wearing a copper-colored silk robe, carrying the cross on his right shoulder while being dragged with a rope by a soldier. It has been on display at the Mary Brogan Museum of Art and Science since March 18, 2011, and was part of an exhibition of 50 paintings on loan from the Pinacoteca di Brera in Milan, Italy. A US government complaint says evidence showed the painting is among many works of art and other valuable items taken in a forced sale from the estate of Federico Gentili di Giuseppe. Gentili died in 1940 in Paris months before the Nazi army invaded France. Gentili’s grandchildren have taken legal steps internationally to find and reclaim works illegally taken from their family during the Nazi occupation in one of many cases involving looted art from the period. “It’s never too late to right a wrong,” ICE Director John Morton said.